Suffering and disability have been innate human problems since the Fall. The topic presents a number of pastoral, theological, philosophical, and practical challenges. So I am excited to share a new resource that seeks to address these challenges biblically and from an Evangelical perspective. Larry J. 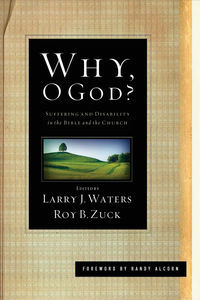 Waters and Roy B. Zuck, eds., Why, O God? : Suffering and Disability in the Bible and the Church (Wheaton: Crossway, 2011). With two in seven American families affected by disability, the body of Christ has a great opportunity for ministry. This new anthology uniquely points the way, training churches, caregivers, pastors, and counselors to compassionately respond. The book’s contributors—ranging from Joni Eareckson Tada and others living with disabilities, to seminary professors, ministry leaders, and medical professionals—do more than offer a biblical perspective on suffering and disability; they draw from very personal experiences to explore Christians’ responsibility toward those who suffer. The volume addresses various disabilities and age-related challenges, end-of-life issues, global suffering, and other concerns—all the while reminding readers that as they seek to help the hurting, they will be ministered to in return. This unprecedented work, which includes a foreword by Randy Alcorn, belongs in the hands of every Christian worker and caring individual who is seeking a real-world, biblical perspective on suffering.